27 April 2011 is the type of day no storm chaser wants to see. The damage surveys are still ongoing, and the death toll continues to climb every time I refresh major news sites. As of this writing, the death toll associated with 27 April 2011 (337) has topped the Super Outbreak of April 3-4, 1974 (319). I can’t claim any ownership of the events. I didn’t chase this outbreak, nor did I chase any of the antecedent storms that grazed Texas, Arkansas, and Louisiana during the prior three days. (Admittedly, I made it as far as Ardmore on Sunday afternoon, before turning around when the first tornadic supercell near Abeliene, TX didn’t hold together, deciding to leave that event to Amos M. and the other chasers already there.) Even if I could have made it to the target area, I think the chase would have been exceptionally challenging (terrain, trees, debris blocking roads, poor visiblity, etc). I also might have run the risk of becoming a victim and requiring assistance that would otherwise be given to local survivors – a position I hope I never come to find myself in. I was certainly aware of the high risk convective outlook from SPC as I went about my business on Wednesday. Around 4:30 p.m. CDT, my husband materialized in my office and told me a tornado was bearing down on Tuscaloosa, AL, and that Lou W. was watching a live tower cam stream in his office. I arrived to find that a small crowd had gathered, and a powerful tornado was squarely in the tower cam’s sights on ABC 33/40 on UStream. A powerful tornado enters Birmingham, AL, as seen from a tower cam on ABC 33/40's live feed. All of us stood and watched in near-real time as the tornado churned across Tuscaloosa, the footage freezing when a power flash lit up its base. Suffice to say, no more work got done that afternoon. I continued to watch the same tornadic supercell rake across Birmingham, AL. I could not tear my eyes away; a terrifying chapter in history was being wrought upon the Deep South. It’s one thing to watch a tornado dance and dart over open prairies, perhaps shredding a shed or a fence or toppling a few power poles along the way. It’s quite another to watch a fat barber pole churn through a populated area, know that it is killing people, and understand that, even with years of knowledge and experience, there is absolutely nothing you can do about it. I felt physically nauseated, and utterly helpless. In those moments, I literally hated being a meteorologist. Why did this happen? There is no easy answer. The winds blow when and where they may. All we can do is read the signs beforehand, and try, with renewed focus, to learn the lessons that the atmosphere is teaching us. To start that process, I’ll posit two observations I made during and immediately after the event. The first was that footage of the the Tuscaloosa tornado bore a striking resemblance to Earle Evan’s footage of the Andover, Kansas tornado of 26 April 1991 (a staple of the Tornado Video Classics series that I and many other storm geeks grew up on). The condensation funnel itself appears gray, while darker, diagonal vortices whirl around the base, like a diabolical parody of a barber pole. I was not the only one who noticed the Andover-esque appearance of the Tuscaloosa tornado; when I posted that comment on Facebook, I was rewarded with a resounding chorus of “I was just thinking that!”) I’ll venture that, while striking, the resemblance is coincidental, and while it may indicate that the two tornadoes share some similar characteristics (such as width, moisture content, debris content, and swirl ratio), the resemblance itself doesn’t have a great deal of scientific significance. My other observation has to do with the SPC preliminary storm reports from April 27. There’s a noticeable dearth of other-than-tornado reports across Mississippi and Alabama, compared to surrounding areas. The tornadic supercells that raked across Mississippi and Alabama must have also produced hail and damaging wind gusts, so where were all the reports? When I pointed this pattern out to some of my colleagues, speculating that spotters were opting to report tornadoes rather than hail or high winds, the response from my colleagues within the NWS was overwhelmingly in the affirmative. The SPC preliminary reports are aggregated from Local Storm Reports (LSRs) compiled by local NWS offices, and NWS doesn’t censor any of the reports coming in (except for the obvious hoax reports). So the bias towards tornado reports in that area arises from the spotters’ individual choices. If you’re watching a tornado while 2″ hail is falling around you, what are you going to report? The hail, or the tornado? Ideally, you’d want to report both, but you can’t report both at the same time. I know that I’d opt to report the tornado first, and the hail second. We still have much to learn from this outbreak, but more urgently, the survivors of these storms need help. The storm outbreak itself lasted four days (25 – 28 April 2011) and impacted areas ranging from central Texas to Washington, D.C. In my judgment, the most effective way to extend a helping hand from a distance is to donate to charitable organizations such as the Red Cross. You can also text “tornado” to 50555 to give $10 to United Way of Alabama. Of course, money isn’t the only resource needed; I’ve got an appointment on Monday with the local blood bank. My planned blog post for this week was an anniversary retrospective about the Earth Day tornadoes I witnessed near Alanreed, Texas one year ago today. Those tornadoes were somewhat ambiguous in number (between three and seven, depending on who you asked), slow-moving, and accompanied by turquoise precipitation bombs. Little did I know that the scenario would unfold similarly a year later to the day. I really wasn’t supposed to be chasing today, but brought the car and camcorder to work “just in case.” And even as the front zippered up all the way from Joplin, Missouri to Oklahoma City in about half an hour, I still waffled until the absolute last minute. The crisp convective towers outside my window tempted me outside to shoot some time lapse footage in the NWC parking lot. From there, of course, it was only a quick hop into my car and a straight shot east once one of the line segments transitioned into a supercell. Our initial target was a supercell east of Seminole, OK, the site of our bust chase last week. However, as we left Norman around 5 p.m., we got stuck behind a large utility truck that couldn’t do more than 45 mph on gentle slopes, and I didn’t feel safe leapfrogging the 20-car convoy that accumulated behind it. Thankfully, they pulled over at a gas station, and we raced east to Seminole. By then, the supercell had moved off to Okemah, and we had become aware of additional supercells developing (including one over east Norman), so we decided to hold up in Seminole for a few minutes to re-evaluate. We changed our target storm and intercepted it just east of Shawnee, OK. It produced a brief wall cloud, but its inflow was clearly being contaminated by precipitation from the Norman storm, and we soon lost sight of it in the rain and decided to let it go. We zigzagged back south and west through Shawnee, intercepting the Norman storm near Macomb, OK. It generated a wall cloud, and even a cascading, precipitation-filled clear slot on its back side, but no tornado. We watched it move away alongside a clutch of other chasers. Panorama showing a precipitation-filled clear slot behind the wall cloud in the Norman, OK storm. The time stamp on my video says 8:00 p.m. at the time of the first funnel, and I had just synchronized my camcorder to GPS time that afternoon, so I’m certain that it’s correct. The second pair of funnels occurred at 8:02 p.m.
Our location is marked by the blue crosshairs. Yikes! Our target storm began to dive southeast, toward Ada, OK. The mass of precipitation to our south continued to grow greener and more ominous, so we retreated back north. Along the way, my husband managed to pull a RadarScope update on his phone, and we were rather shocked to realize that we were looking down the maw of our storm’s inflow notch. Not a good place to be! We encountered RaXPol, containing classmate/fellow chaser Jeff S., my former adviser, Howie Bluestein, and their ARRC engineer (John). They had collected data in an earlier wall cloud, but did not collect any data in the tornadoes. They decided to call it a night and headed west along OK-59, and we decided to follow. Along the way, we encountered some debris just east of Byars – some sheet metal peeled off a barn was blown from the north to the south side of the highway, gravel scattered across the road surface, and a power pole blown down nearby. As we gingerly tried to navigate the debris, some intellectual luminary two vehicles ahead of me got out, picked up the wet power line with his bare hands, moved it out of the road, then got back into his vehicle and drove away. All I can say is, thank goodness the line was dead! I could have witnessed a Darwin Award in the making. I’ve asked around, and I am apparently the only one who noticed that this happened, and unfortunately, I had turned off my dash cam just a few seconds before, so for all you know I could be making the whole thing up. I’ve since seen video of a solid stovepipe tornado in the Byars storm, definitely a more substantial one than either of the two tornadoes that showed up in my video. I speculate that the brief funnels that Dan D. and I witnessed may have been vortex arches being drawn up into the Byars storm’s updraft, resulting in a counter-rotating pair of vortices (something I found – twice – in my Ph.D. research on the 4 May 2007 Greensburg tornado). Fascinating stuff! I’ll reveal upfront that we didn’t catch any tornadoes on Thursday. The atmosphere decided to skunk us at every turn, failing to produce tornadoes in our target storms, then proceeding to spawn tornadoes minutes after we bailed for other targets. The day started out with great anticipation. A negatively-tilted trough, along with other favorable ingredients, had appeared in model runs for several consecutive days. Originally, the prospective target was the eastern Oklahoma-Kansas border, around Bartlesville. We’d already arranged a three-car caravan to go chasing, including several new/guest chasers, thinking the odds were pretty good that we could bag them a first tornado. About 24 hours before chase time, it became clear that the trough was digging farther south than originally thought, so we shifted our target south into eastern Oklahoma, where SPC had delineated a moderate risk area with extensive discussion about favorable conditions for supercells all along the dryline. Concerns about lack of low-level moisture return were allayed by mid-60s dewpoints spread across eastern Oklahoma (as seen by the Mesonet) on Thursday morning, and a strong signal appeared in both the NSSL WRF and HRRR models for isolated supercellular convection in eastern Oklahoma, south of I-40. In the meantime, the warm sector north of the Kansas border looked more and more like an uncapped mess, so we decided to eliminate it from our target. Our caravan departed Norman just after lunchtime, stopping along I-40 north of Seminole as convective towers began to bubble all along the dryline. The “tail-end Charlie” storm near Atoka, OK, about 60 miles to our south, quickly became dominant. However, we were reluctant to blast south after it, because it would have meant committing to a storm that would certainly move into difficult, forested, hilly terrain, while further eliminating the northeast quadrant of Oklahoma from our target area, where other storms with wall cloud and funnel cloud reports were already occurring. Dan's GR3 display at 4:38 p.m.
We decided to wait for a cell that developed immediately to our southwest. For a while, it seemed like a good choice. This “middle” storm gradually gained strength and assumed supercell shape on radar. It had good separation from the storms to its south, which raised our hopes for uncontaminated inflow. However, I noticed that just about every blip on the KTLX radar had a supercell shape to it – an indication that the local atmosphere was almost uncapped, that convection was likely to fire up everywhere around us, and that outflow boundary and storm-storm interaction might prevent a single storm from becoming dominant. We decided to sit tight, preach patience, and wait for our nearest cluster of storms to get its act together. Brief wall cloud north of Okemah, OK at 6:17 p.m. When one storm in our cluster finally did become dominant, we proceeded to chase it north of Seminole, then abandoned it as it gusted out and another cell to its southwest began to grow. Of course, just a few minutes after we departed our original target storm, GR3 flashed a tornado report from a credible chaser underneath it. D’oh! We watched our second target storm produce and dissipate a couple of wall clouds, then decided to race east on I-40 after our original target storm, now located over Okemah, OK. We easily caught up with it again, and watched for a few minutes as it, too, generated and dissipated a wall cloud with a clear slot, but refused to complete the display and produce a tornado. As we zigzagged north and east through Morris, OK, nickel-sized hail pelted our caravan. It didn’t make us feel much better that the Atoka storm, well out of our reach to the south, was leaving a trail of tornado reports in its wake. As we passed the wind profiler station near Haskell, OK, its measured wind profiles indicated a weakness in the hodograph between 1 and 3 km above the surface – a possible clue as to why these storms seemed almost incapable of generating persistent low-level rotation. We eventually called off the chase after dark, just north of the town of Wagoner, east of Tulsa. We were treated to some spectacular ground-to-cloud lightning, a consolation prize of sorts, on the drive home. Tornadoes to the north, tornadoes to the south. Guess where we were? Yesterday stung more than I expected it to. It was a day that reminds me how much I still have to learn about storms. A group of experienced chasers made near-unanimous decisions that probably would have paid off in most situations. In the end, our decision to avoid the difficult terrain east of Ardmore probably cost us a glimpse of the Tushka tornado, but at the same time, I know of some people who did commit to that storm and still didn’t see a thing, thanks to trees (both standing and fallen), and the notorious terrain that compelled VORTEX2’s organizers to cut a chunk of SE OK out of their operating domain. But, no guts, no glory. For those who are curious what we missed, I’ll link to this video shot by our friend Gabe G. and his chase partners. Unfortunately, this tornado caused two fatalities, numerous injuries, and extensive damage in Tushka, OK. In light of that, our bust chase seems pretty trivial. To their credit, our guest chasers were all very good sports about the situation. A couple of them can’t wait for another chance to chase, and it looks like there are, indeed, other opportunities peeking over the horizon. I started out my Saturday at a meeting of the local Norman ham radio club (W5NOR), where I was invited to give a talk about my Ph.D. research on the 2007 Greensburg storm and tornado. By the end of the day, I’d be watching yet another supercell track near Greensburg. Dan D. and I briefly considered making the long drive up to Iowa, where were convinced a significant severe weather outbreak was going to occur. However, we were reluctant to shoulder the fuel expense (gas is now approaching $3.75/gallon, even in central Oklahoma) and the long drives there and back, so we looked to more local targets. I was not terribly impressed with any of the high-res WRF and HRRR solutions for 9 April over Oklahoma and Kansas, which consistently showed brief, disorganized bursts of convection, primarily at and after sunset. However, we joined a three-car caravan (including former officemates Jeff S. and Jana H.) and headed up toward Wichita. We spotted some wind damage near Blackwell, OK, caused by outflow from a supercell that crossed I-35 near sunset the day before. Discouraged by the clear blue skies surrounding us, we held up briefly just north of Wichita, KS, then again in Kingman, KS. As 00Z approached, I was not optimistic. We had a number of “guest” chasers in our caravan, so we decided to target an anemic-looking blip that appeared near Woodward, OK. Haze prevented a good view of the associated cumulus towers until the sun dipped down behind it. I was encouraged that the updraft was substantial enough to completely block the sun, and the reflectivity values in the core continued to increase with time. As we approached the storm along U.S. Hwy. 50/400 (which is vastly improved after years of construction, by the way), it took on a more supercellular appearance on KDDC. Interestingly, the storm’s motion was that of a left-mover (racing northeast at 55 mph), and a notch and mesoanticyclone developed on the storm’s northern flank. As the sun finally set at 8:04 p.m. CDT, we also saw hints of a hook and mesocyclone on the storm’s southern flank. The storm had a split personality! North of Pratt, we passed an area of wildfire damage, with some stumps and trees still smoldering orange in the twilight. (Didn’t get any pictures of this, unfortunately.) The storm continued to race away to the northeast. Its base appeared to be well over 1 km AGL, a result of the 25-to-30 degree F temperature-dewpoint spreads being analyzed in the area. We stopped to watch the storm move away into the gathering darkness, then called the chase off. As we headed back to Pratt to get food, we managed to raise Amos M., who was chasing a few miles away from us, on amateur radio, and convinced him to join us for dinner at Playa Azul. We hadn’t seen him since the previous chase season, and it was good to catch up. Afterward, he joined our caravan as we headed back down I-35. We made it back to Norman around 2 a.m. Along the way, reports surged in of the tornado outbreak in Iowa, including extensive damage in Mapleton. Even though I didn’t see a tornado on a day when so many others did, I don’t feel any great regret over our choice of target. We saw a photogenic supercell that exhibited interesting behavior, and didn’t have to stray that far from home to do it. The future of tornado research? VORTEX8: For real this time! Abstract: Despite the best efforts of research and forecast computing systems, tornadoes still manage to terminate a handful of taxpaying, backwater yahoos every year. The field phase of VORTEX8 will last from February to June of 2113. This time period has been selected to coincide with the changed climatological maxima for X-tremely severe thunderstorms and tornadoes across the Southern (February and March) and Northern (April and May) Great Plains regions. Unlike previous field research efforts to study tornadoes (particularly VORTEX5, which was a spectacular waste of everyone’s time that we won’t mention further), the VORTEX8 instrumentation will be entirely automated and no human (or grad student) participation will actually be required. The instrument ‘swarm’ will consist of an assemblage of approximately 10,000,000,000 nanoradars, nanonets, and nanocams (drones), all controlled by an exa-scale uber-computer (queen) that will detect vorticity maxima through real-time assimilation of the swarm members’ trajectories and measurements, and automatically migrate the swarm to promising tornadoes (XEEF-3 or greater) via the “SASSInet.” The drones, powered by onboard fusion pico-reactors, will automatically disperse to designated locations in relation to the tornado, collecting data throughout its depth (both interior and exterior). For the duration of this experiment, the PIs have promised to disengage their respective drones’ battle protocols and thus the loss of drones due to ‘hostile scientific competition’ is expected to be negligible. Illustration of the VORTEX8 data collection strategy. Data from the swarm will be assimilated in real time into micrometer grid scale computer models and disseminated to the public at large via the universal interjack. Intellectual Merit: Thanks in large part to the seminal publication “The six degrees of tornadogenesis” in 2055, tornado warning lead time is now an unprecedented 5.2 hours. Nano-instrumentation has enabled tremendous strides in elucidating the dynamics, kinematics, and behavior of tornadoes, suction vortices, micro-vortices, and all manner of lesser whorls. 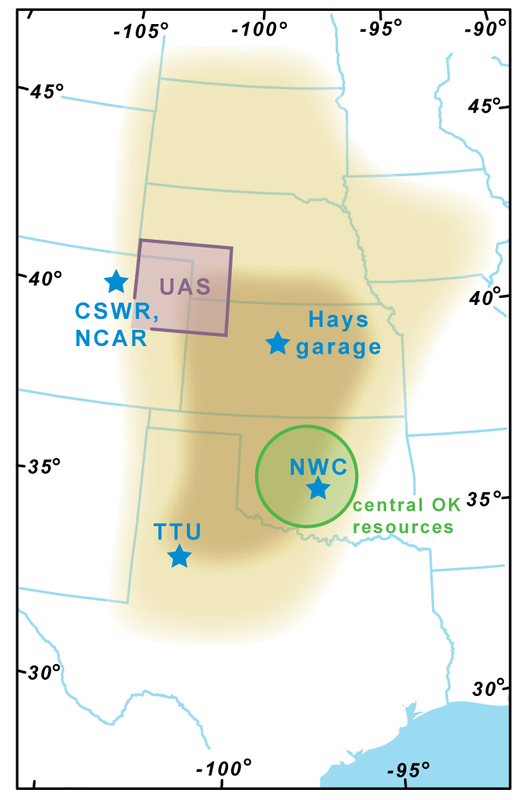 However, the exact mechanism(s) by which tornadoes loft and transport individual, millimeter-scale particles and pieces of debris, such as individual aerosol particles and strands of animal fur, represent fertile territory that remains to be explored in a comprehensive observational and numerical study. Advances in the understanding of molecular-scale interactions and quantum entanglement are expected as a direct benefit of this experiment. Plus, let’s face it, tornadoes are still the shiznit, and old scientists just can’t seem to let them go. Broader Impacts: Although the usage of the automated sensor swarm will preclude the need for direct student participation in the field phase, it is estimated that approximately 140,000 graduate students will need to be employed to manually dealias the data from billions of nanoradars. In addition, at least fifteen Martian and four Titanian Ph.D. candidates candidate will observe the experiment. It is expected that these students will later apply some of the nano-swarm technology to studies of other vortices in the solar system, including but not limited to Martian dust devils and the Saturnian polar hexagon, respectively. Okay, I’ve stretched that premise well past the breaking point. APRIL FOOLS’! Seriously, though, I yearn to know how tornado and severe storms field research will evolve in the next 100 years. Will there ever be another Project VORTEX? And what questions will we seek to answer in those efforts?